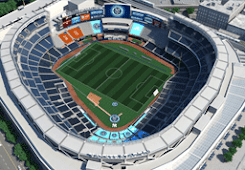 NYC is Blue: Next: Frank Lampard? Following right on the heels of reports that Spanish international David Villa has signed with NYCFC comes a rumor that the club has already secured its second Designated Player, England midfielder Frank Lampard. Report: Are New York City FC on the verge of signing global stars Frank Lampard & David Villa? According to multiple reports, MLS expansion side New York City FC could be on the verge of signing two very high-profile attacking players: English attacking midfielder Frank Lampard and Spanish forward David Villa. No word from the club, but reports in the UK claim that Lampard, who was told he is no longer in the plans for his longtime Premier League club, Chelsea FC, visited NYCFC owners Manchester City on Saturday to discuss a potential deal. Lampard, 35, is part of the England squad headed to Brazil for the World Cup, where they will take on Uruguay, Costa Rica, and Italy in Group D.
He has been linked with a move to MLS for several years, particularly to the LA Galaxy, but he has never before inked a deal. At the same time, on Saturday, reports emerged that Villa, 32, was spotted in Manchester, as well, supposedly to undergo a physical before completing a deal. Again no word from NYCFC, but the Atletico Madrid star, who was named to the Spanish World Cup squad on Saturday, could reportedly train with Manchester City until NYCFC convene in preparation for their MLS debut in 2015. Chelsea is moving towards a youth movement, but Lampard still appears to have plenty left in his tank. And the man's been a winner on the global stage, very important to have if NYCFC's roster is to include younger players.